Chris and Ashley Abroad: Visitors! Chris and I renewed our love for our profession last week when we celebrated spring break. This vacation was made all the more sweet because we had our first visitors to our new residence. 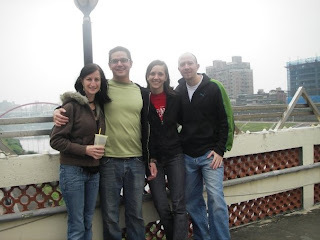 My brother and sister-in-law, Harrison and Ali, made the trek from Santa Barbara to spend a week with us in Taiwan. They arrived late Sunday night and we took an unintentional tour of Taipei as our taxi driver decided to take the long way home. As my grandmother used to say, it didn’t take long to spend the night and we were off and running Monday morning showing off our adopted city. 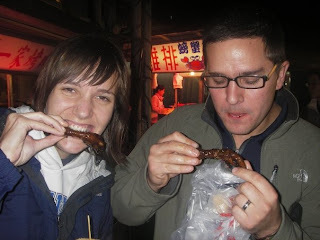 We wandered all around seeing the tourist sites and the not-so-tourist sites and, of course, experiencing Asian culinary delights. I think that for the first day, Harrison and Ali were impressed with the Mandarin that Chris and I had picked up. Seeing as how they learned everything that we knew during their one week, the awe-factor wore off quickly. Tuesday, we had a relaxed morning as Chris watched the NCAA basketball cha mpionship game. Needless to say, he was delighted that not only did Taiwan air the game, we had a day off so that he could spend all morning watching it. 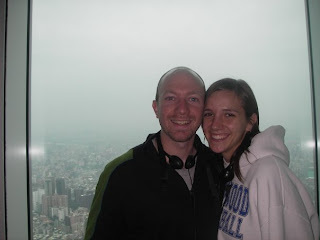 After the game, we decided to head downtown and journey to the top of Taipei 101, so named for its 101 stories. Until August of this year, it will be the tallest building in the world. We were excited to make it to the top while it still has this distinction. The building brought surprises around every corner; the impressive views were interspersed with random golden ant art exhibits, a coral museum, and ample opportunities to purchase memories from your experience on top of the world. We enjoyed a late lunch at one of our favorite where the chef and owner, Bernie, made the meal quite memorable. Afterward, Ali was feeling adventurous so she and I went to the local salon where they gave us both new styles of their choosing. The hour and a half scalp and back message was a hit, however the Asian coif didn’t go over as well. 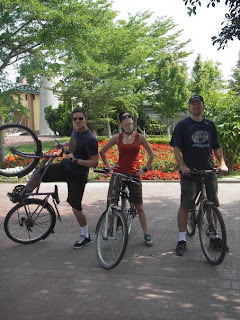 After a bike ride through some gardens on Friday morning, we boarded the train back to Taipei. We made reservations at a famous dim sum restaurant and enjoyed being back “home.” Saturday was busy as we tried to fit in everything that we still wanted to do. We went to the National Palace Museum and the Jade and flower market. We attempted to make it to Taipei’s hot springs but were a little late. We settled for the riverside night market of Danshui instead. Easter Sunday we went to church and before having to bid our guests farewell, we had one last Taiwanese experience as we got some famous “bubble tea.” We had a great time playing tour guide and were sad to see them go. Hopefully, this blog was enticing and we’ll have some more visitors soon! We’ll make sure to have plenty of rocks for you to paint and appointments to get your hair cut. Oh how fun! I'm so glad they got to come see y'all! And I love the hair! You have bangs! Well, i don't know if painting rocks will get me to Taipei (we have the not so famous "painted by U" stores here, don't forget) But the hot springs just might! Maybe we'll get to make the trek at some point.